Books that will hopefully be in my future classroom! 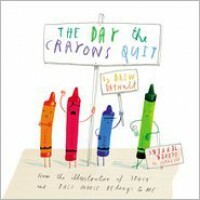 The Day the Crayons Quit by Drew Daywalt is a very fun book about the different crayons writing letters to their owner asking him for different things. This book is very simple but different because each letter has the specific color on it and they all have different handwriting. The majority of the letters are also really funny which the children with love! If I were going to use this book in my classroom I could use it to go over colors in the younger grades, so we could have the different crayons cut out and play a game to match the crayon with the name of the color. If I were using it in an older classroom I could teach a lesson about writing a letter and then we could write letters back to one of the crayons. Either way I think it would be a great book to have in the class!